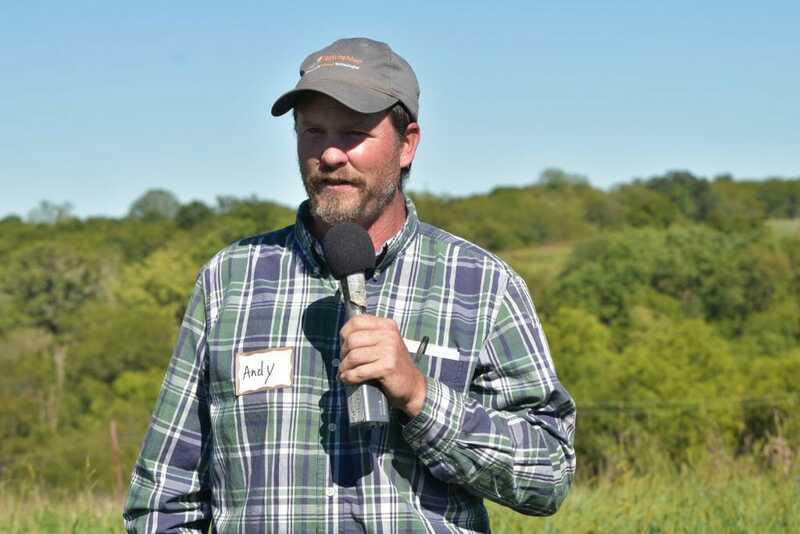 On September 22, forty people gathered in the rolling hills of northern Missouri to learn from grazier, Andy Welch of Welch Family Farms. “Daily [cattle] moves is when I started seeing improvements in my soil,” said Andy, who first learned about rotational grazing in 1995. He started with monthly rotations, then weekly and now he moves his herd to a new paddock each day. Diversity of forage species is a key element of regenerative grazing. One of Andy’s mentors is Doug Peterson, a regional soil health specialist with the Natural Resource Conservation Service (NRCS). Doug demonstrated to the group the power of proper management and its effect on the soil using the slake test and rainfall simulator. Andy Welch of Welch Family Farms near Grant City, MO. Doug Peterson, NRCS, demonstrates the rainfall simulator. The tests illustrated the capacity of soils to reach their full potential when proper management, such as regenerative grazing, is practiced. During the demonstration, the most surprising finding was how poorly the hay ground infiltrated the rainwater, instead running-off. Most would think hay ground is healthier since it provides living roots in the ground year-round and is not tilled. 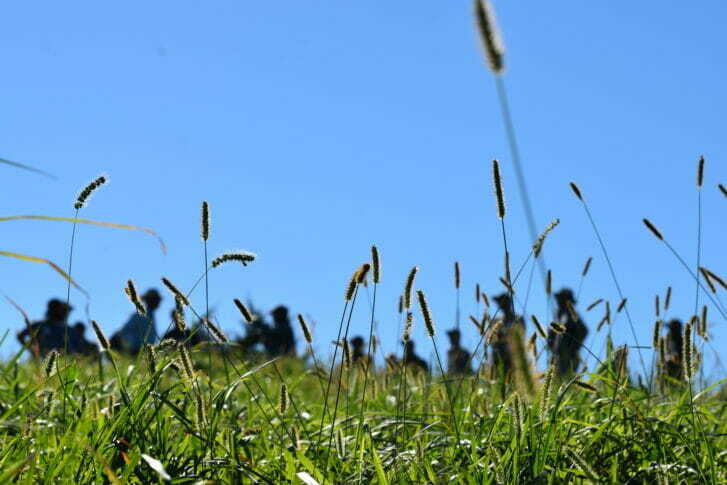 When fields are cut to make hay, farmers mow all the grass in a short period of time, and on the sunniest days. This causes the temperature of the soil to rise dramatically, by 20 to 40 degrees F. Suddenly, all the life in the soil sub-surface (fungi, bacteria, nematodes, etc.) are subject to increased temperatures that they are not adapted to thrive in. “You roast the top three to four inches of the soil, which kills soil critters,” explained Doug. The first organisms to repopulate the first three or four inches of soil are bacteria. Bacteria consume the glue (called glomalin) that holds soil particles together. When bacteria dominate soils and are not kept in balance with fungi, more glue is eaten than is produced. This leads to soil structure collapse significantly reduces the infiltration rate as the non-glued particles suspend in solution and clog existing pore spaces, which leads to poor infiltration and run-off. 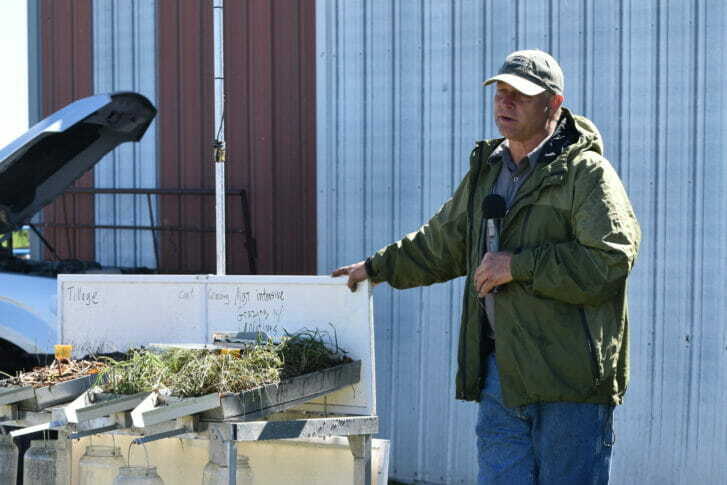 For Andy, his goal is to graze cattle year-round, minimizing the amount of hay he feeds. To achieve this goal, he relies on native warm- and cool-season forages, along with stockpiling for winter feed. Essentially, he’s trying to emulate the grasses of a prairie. In grazing systems, much of our focus has been on improved, introduced cool-season forage species like clover and alfalfa. Native species, such as Virgina wild rye, June grass and Canada wild rye are overlooked. These cool-season natives contribute to Andy’s year-round grazing plan. Andy also believes that “weeds” contribute value. His pastures are spotted with Queen Anne’s lace and chicory, which are working to pull up nutrients from the soil. When consumed by cattle, these nutrients get recycled through manure. “My cows are eating giant ragweed right now. I don’t second guess my cows, they’re way smarter than I am,” expressed Andy. He’s never spent money on seed and believes “every seed you’ll ever need is already in the soil.” Regenerative grazing helps express the soil seed bank. When winter comes to northern Missouri, Andy’s cattle graze through the snow. When stockpiling, he warns that wet, heavy snow deteriorates the quality of the stockpile. “It’s critical to ration it so cattle aren’t able to stomp it all down,” said Andy, who likes to see a little green mixed in with the dead residue, which helps cattle better utilize what’s there. One way Andy is looking to increase stocking density is by adding goats to the mix. He struggles with volunteer trees in his pastures, and goats would help keep unwanted vegetation in check. He plans to buy goats in the spring and sell them in the fall, to avoid having to feed them over winter. “I think I can get my cows to eat the same forage species as sheep would,” said Andy, explaining how goats fill his need. Diversity in grazing animals contributes to the regeneration of soils. 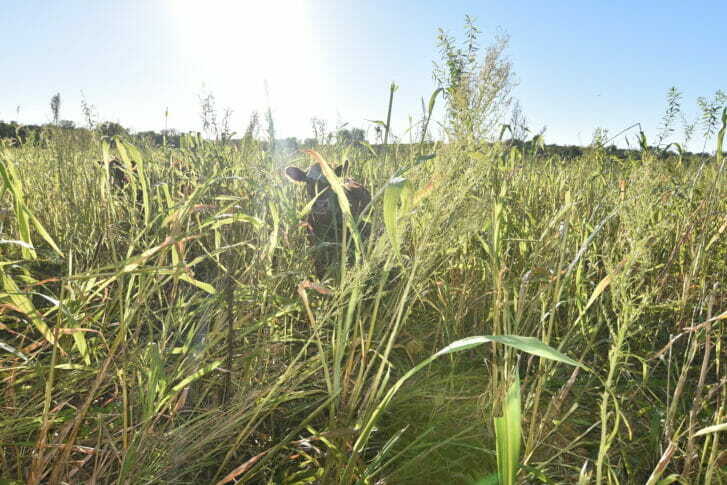 Heifers graze warm-season annual species, such as sorghum-sudangrass and sunn hemp, planted in river-bottom fields that once grew corn and soybeans. Andy is using annuals and grazing to suppress weeds while he transitions these acres to organic production. Other points of discussion were thinning stands of trees to practice silvopasture, tracking grazing moves with the PastureMap app and grazing heifers on warm season annuals. Thank you to the Welch family and the Green Hills Farm Project for contributing to this event! 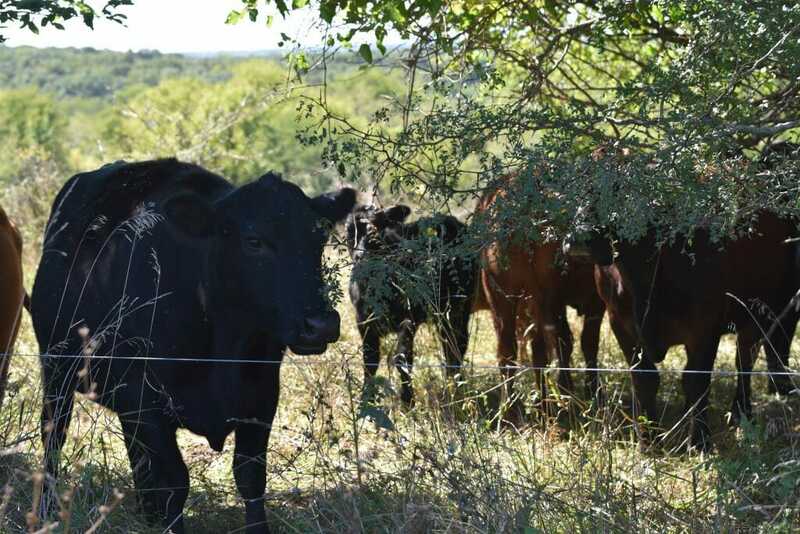 What can you learn just by looking at your pastures?